A reverse transcriptase loop-mediated isothermal amplification (RT-LAMP) assay was rapidly used to detect serotype Asia 1 of foot-and-mouth disease virus (FMDV) within 45 min at 61°C. All FMDV serotype Asia 1 reference strains were positive by RT-LAMP, while other viruses such as FMDV serotypes O, C, A and classical swine fever virus, swine vesicular disease virus, porcine reproductive and respiratory syndrome virus and Japanese encephalitis virus remained negative. Furthermore, FMDV sreotype Asia 1 positive samples were able to detect by RT-LAMP assay. This RT-LAMP assay may be suitable particularly for diagnosis of FMDV serotype Asia 1 infection in field stations. Foot-and-mouth disease virus (FMDV) is a member of the genus Aphthovirus of the family Picornaviridae, which is divided into seven serotypes with no cross-protection conferred among the serotypes . FMDV serotypes O, A, C are widely distributed worldwide, whereas FMDV serotypes SAT 1, SAT 2, SAT 3 are normally restricted to Africa and FMDV serotype Asia 1 to Asia [2, 3]. Due to the aggressive nature of foot-and-mouth disease (FMD), outbreaks usually result in severe economic losses and impact on both national and international trade within the livestock and animal products [4–6]. Rapid and accurate diagnosis of any suspected FMD cases is of utmost urgency to control this veterinary infection given the extreme contagiousness of the causative virus. Conventional laboratory diagnosis of FMD was made by enzyme-linked immunosorbent assay (ELISA) detection of specific viral antigens and by observation of cytopathogenic effects in cell culture [4, 7–9]. Alternatively, conventional reverse transcriptase polymerase chain reaction (RT-PCR) [5, 10–14] and real-time RT-PCR [6, 15–18] were developed to complement primary diagnostic techniques for the FMDV infection. These assays were time-consuming and laborious, which required centralized laboratory facilities and clinical specimen submissions, resulted in the delay of FMDV diagnosis. Given these problems, a rapid, simple, and practical assay to detect FMDV in animal and its products was therefore required in clinical practice. A novel nucleic acid amplification method, termed reverse transcription loop-mediated isothermal amplification (RT-LAMP), which was applied successfully to the detection of influenza A virus, Newcastle disease virus and classical swine fever virus, porcine reproductive and respiratory syndrome virus [19–22]. In this study, RT-LAMP assay was developed a diagnostic method for the typing of FMDV serotype Asia 1, and then the sensitivity and specificity of the RT-LAMP assay were evaluated using the clincal samples. Four primers including FIP, BIP, F, and B for RT-LAMP were designed by targeting the conserved regions of VP1 sequence from FMDV serotype Asia 1 (Table 1). RT-LAMP was performed in 25 μl of a mixture containing 1 μl of RNA, 25 pmol (each) of primers FIP and BIP, 10 pmol (each) of primers F and B, 1 U of the THERMO-X reverse transcriptase (Invitrogen) and 6 U of Bst DNA polymerase (New England Biolabs) with the corresponding buffer, respectively. Amplification was carried out at the different temperatures. The reaction was then terminated by incubation at 80°C for 2 min. Detection results of the RT-LAMP assay using 125 clinical samples. To optimise the RT-LAMP assay, the different temperatures 60, 61, 62, 63°C at 25, 35, 45, 55 min were evaluated. Already after 45 min at 61°C a obvious product could be visualised by gel-electrophoresis in the study. Another useful feature of RT-LAMP was that its products can be observed directly by naked eye, because a white precipitate of magnesium pyrophosphate forms in the reaction tube . Adding the chemical dyestuff to LAMP reactions also was able to increase the ease detection by the naked eye . To check that the RT-LAMP reaction was specific for FMDV serotype Asia 1, RNA from reference strains including FMDV serotypes O (O/CHA/1999, O/CHA/2009), A (A/CHA/1972, A/CHA/2009), C (C/SU/1958), Asia 1 (Asia 1/JS/2005) and classical swine fever virus (CSFV), swine vesicular disease virus (SVDV), porcine reproductive and respiratory syndrome virus (PRRSV) and Japanese encephalitis virus (JEV) were tested. 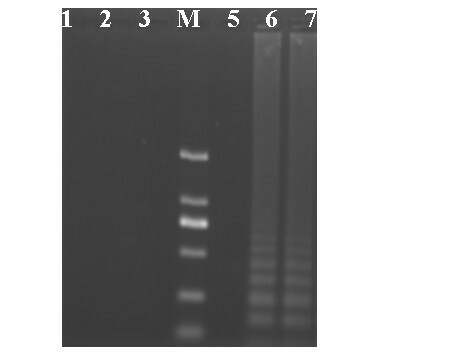 The results indicated that the RT-LAMP assay was able to type the FMDV serotype Asia 1 strain used in this experiment as each showed the characteristic ladder-like pattern in the gel (Figure 1). As expected, the other viruses containing FMDV serotypes O, C, A and CSFV, SVDV, PRRSV or JEV gave a negative result by the RT-LAMP assay. Agarose gel electrophoresis analysis of the RT-LAMP products using the FMDV reference strains. Lane 1, O/CHA/2009; Lane 2, A/CHA/2009; Lane 3, C/SU/1958; Lane M, DNA Marker DL2000 (2000, 1000, 750, 500, 250, 100 bp); Lane 5, O/CHA/1999; Lane 6, Asia 1/XJ/2003; Lane 7, Asia 1/JS/2005. To assess the applicability of this method, 125 clinical samples were used in the study (Table 2). All samples were also identified by RT-PCR, respectively. The details of primers and condition for the RT-PCR assay for the detection of FMDV have been previously described . The result indicated that 20 positive samples of FMDV serotype Asia 1 were typed by RT-LAMP, but 32 FMDV serotype O, 5 FMDV serotype C, 22 FMDV serotype A, 17 CSFV, 10 SVDV, 10 PRRSV, 9 JEV samples gave the negtive in the study. Details of RT-LAMP primers designed for detection of the VP1 sequence of FMDV serotype Asia 1. Taken together, the RT-LAMP assay was rapid, specific, and sensitive for typing FMDV serotype Asia 1 in clinical samples from the infected pigs. This method not only reduced the diagnosis time significantly but also may be a potential for wider use in field practice. Hao-tai Chen, Jie Zhang contributed equally to this work. This work was supported in part by grants from the National Key Technologies R&D Program of China (No. 2006BAD06A03). This study was also supported by the National Natural Science Foundation of China (No. 31172335, No. 30700597 and No. 31072143). HT C and J Z designed the research, then carried out most of the experiments. XT L supported experimets. HT C and YS L wrote and revised the manuscript. All of the authors approved the final version of the manuscript.